We offer several types of 3D DVDs. Field Sequential 3D DVDs work best with CRT TVs and require electronic shutter glasses to work and can be also be viewed on any 3DTV or 3D monitor from a computer used with our Stereoscopic Player Software. Side by side work on the new 3D TVs and 3D Blu Ray Players. Sensio Anaglyph 3D DVDs are viewed with red/cyan, green magenta or red/blue glasses. These movies can be viewed on any conventional (pre-HDTV) TV or CRT monitor in real 3D with the use of the Shutter Glasses we offer! All the movies we offer were shot in excellent 3D and are not the poorly done conversions that are often found on the internet. These are real 3D. Please make sure to get Shutter Glasses . This is also called FS (Field Sequential)! FS uses electronic shutter glasses instead of red-blue anaglyph. The result is an outstanding picture. NEW Alternatively you can view these in other modes (Anaglyph, side by side, 3DLCD, New Samsung 3D DLP rear projection and other 3D enabled TVs) using our Stereoscopic Player Software with a PC computer with Windows More information. It can then be viewed on you TV assuming you have video or HDMI output from you computer. These are SD (Standard Definition) DVDs. This stereoscopic 3D video portrays a successful adventure trek and technical summit attempt of the highest mountain in North America. 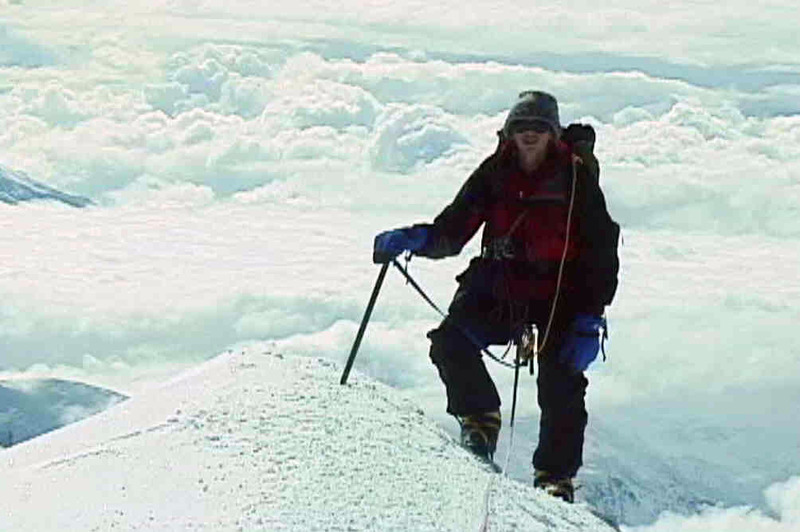 Also known as Mount McKinley, Denali has an altitude of 20,320� and is one of the Seven Summits of the World. Situated in Alaska near the Arctic Circle, a June Denali climb is spent entirely without darkness � essentially a single month-long �day�. And being so far North and so high, the entire climb, from flying into Base Camp via bush plane, to up-and-down the Kahiltna Glacier with repetitive carry and move snowshoe pack trips, to steep ascents near the 20,000� Summit Ridge is spent entirely on snow. 2D and 3D versions are included! This like all DVDs on this page is in field sequential 3D format. For use with our shutter glasses or 3D HMD displays. Zombies, Zombies and more Zombies... Tara Woodley is a reporter looking to do a story on the famous ghost legends of an old desert town. But she can't seem to find the place until she picks up a strange hitchhiker, Ebenezer Jackson, who tells her he knows the way. Ebenezer proceeds to lead the skeptical Tara on a journey... one involving a variety of characters like the Army Sergeant whose vicious cruelty kills a recruit and the three hapless campers who bumble into an old, cursed outlaw cemetery. All these folks have one thing in common -- THEY'RE DEAD! Thanks to some very angry zombies! Will Tara survive her research into 3-D horror thrills? For use with our shutter glasses or 3D HMD displays. Probably rated R.
No collection is complete without this incredible assortment of rare material. 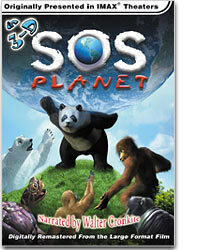 The SCSC DVD contains well over one hour of 3-D fun, including short films, videos and computer generated imagery. Plus, its field sequential 3-D format can be viewed with readily available, inexpensive hardware. Get your copy now! A portion of the proceeds of the sales of this item go to support the Stereo Club of Southern California. This DVD is in field sequential 3D format. For use with our shutter glasses or 3D HMD displays. Never before offered at this price! More information, reviews and contents. Filmed in Genuine 3D! Full length feature in high quality field sequential 3D. This DVD is in field sequential 3D format. For use with our shutter glasses or 3D HMD displays. More information Probably R Rated. One-of-a-kind hilarious holiday fun for all. This is the field sequential version not the anaglyph version! This DVD is in field sequential 3D format. For use with our shutter glasses or 3D HMD displays. 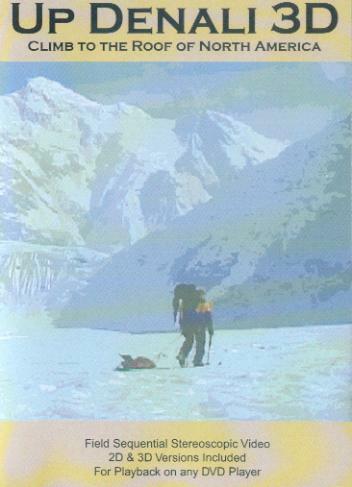 Rated G.
Electronic Press with Film Clips, Sound bites and Behind the Scenes Only available as part of Product Special. Transform your living room into a multi-dimensional experience of sound and motion! Join the Glagoliths in this first full-length digitally animated giant screen 3-D film and become immersed in a succession of eye-popping adventures. Be prepared to venture into the bowels of an underground Arabian palace fully loaded with dungeons and dragons... plunge into an underwater fantasy and come face to face with mechanical sea monsters and an all too real virtual shark... Not for the weak of stomach! Zoom down a slick, winding ice track at astounding speeds. Hold on to your seats, and don't say we didn't warn you! Also features a 3D and 2D Virtual Image Gallery. Please make sure to get Shutter Glasses . Join Stuart Pankin and Elvira - Mistress of the Dark on a groundbreaking venture into the realm of 3-D filmmaking, where captivating computer generated imagery mixed with live action thrills abound. Encounter early incarnations of the third dimension, from a recreation of one of the earliest 3-D movies ever made to classic clips from Hollywood's 3-D heyday during the 1950's to modern creations such as James Cameron's theme park attraction, Terminator 2: 3-D. 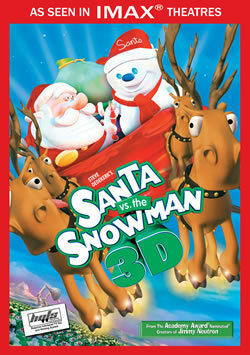 Experience the wildest 3-D adventure ever created for the giant screen!
" Packed with seat belt-required sequences that showcase the thrills of large -format 3-D. Wildly Imaginative!". -- Hollywood Reporter Please make sure to get Shutter Glasses . Experience a whirling visual thrill ride as Johnny explores the underworld of the castle to the explosive climax where Johnny confronts Mr. D and fights to free his mother's spirit! Also features a 3D and 2D Virtual Image Gallery. Please make sure to get Shutter Glasses . "Nothing short of astounding!" --Edmonton Sun Do you dare step through the doorway! Theatrical Trailers in 2D & 3D. Produced by nWave Pictures in association with the World Wide Fund for Nature - The Netherlands (WWF), SOS Planet breaks new ground with dramatic digital effects used in ways never before seen on the giant screen. One World. One Future. Please make sure to get Shutter Glasses . In this feature, the awesome 3D effects set against the backdrop of the Grand Canyon are sure to impress anyone. It comes highly recommended both for its visual effects and entertaining story of a young boy having a dream of becoming a pilot and pursuing it despite all odds. In the film, we watch as he matures from boy to man, trying all manner of crazy flying stunts. The movie climaxes with an aerobatic aircraft competition over the spectacular backdrop of the Grand Canyon, Little Colorado River and Lake Powell� the most dynamic aerial stunts ever shot in large format. The flying talents of the pilots will give any audience the thrill of a lifetime! Please make sure to get Shutter Glasses . Dual DVD: 2D on one side, 3D on the other! Ten years ago, a series of brutal murders rocked peaceful, isolated Camp Blackwood. 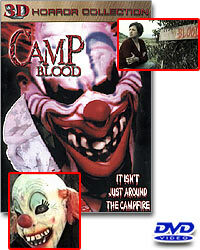 The killer was never caught and the camp, renamed "Camp Blood" by the locals, was closed. Camp is the operative word in this movie, while it has great 3D effects the production values (continuity, story, and acting) leave a bit to be desired. Today, two young couples decide to visit Camp Blood. Ignorant of the camp's terrible history, they hike deep into the woods. Soon the campers realize they are not alone. Someone is watching... waiting. The murders at Camp Blood are far from over... they have only just begun. This like all DVDs on this page is in field sequential 3D format. For use with our shutter glasses or 3D HMD displays. Will anyone make it out of Camp Blood alive? Lock and load... it's open season for REVENGE! When two campers on a peaceful weekend excursion are suddenly confronted, harassed and molested by a pack of heavily armed outdoorsmen, a brutal series of events ensues. 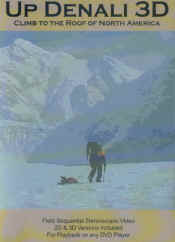 A struggle for survival and sanity drives the surviving victim into a bloody vendetta of rage. Like Camp Blood, while this has good 3D effects the production values (continuity, story, and acting) leave a bit to be desired. The hunters become the hunted when they're confronted and pursued in a malicious game of cat and mouse! Will they survive her rage into 3-D horror thrills? This like all DVDs on this page is in field sequential 3D format. For use with our shutter glasses or 3D HMD displays. .
Strap yourself in and prepare for an APT. 51 Cosmic Film Bash! Join two stranded alien observers as they pass the time on Earth, enjoying a truly spacial home theater system. And what better way to enjoy their hardware than to watch the best of the baddest that tinsel town has to offer! Two demented hosts share unique and cutting alien insight as they critique the worst of Hollywood film history. The Apartment 51 series is interesting in that the reptile characters are in 3D and they are watching a 2-D movie. So this is a 3-D movie with significant portions in 2D. This like all DVDs on this page is in field sequential 3D format. For use with our shutter glasses or 3D HMD displays. Strap yourself in and prepare for an APT. 51 Cosmic Film Bash! Join two stranded alien observers as they pass the time on Earth, enjoying a truly spatial home theater system. And what better way to enjoy their hardware than to watch the best of the baddest that tinsel town has to offer! Two demented hosts share unique and cutting alien insight as they critique the worst of Hollywood film history. 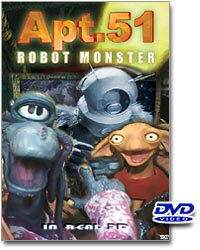 The Apartment 51 series is interesting in that the reptile characters are in 3D and they are watching a 2-D movie. So this is a 3-D movie with significant portions in 2D. This like all DVDs on this page is in field sequential 3D format. For use with our shutter glasses or 3D HMD displays.